Knowing the warning signs of a stroke can save a life. There are 3 major signs of a stroke that are becoming well-known, but there are also 6 uncommon signs that you should know too. A stroke is a medical emergency that occurs when the supply of blood to the brain is compromised by a clogged or burst artery. F – Face. If someone’s face is drooping on one side, it could be a stroke. As them to smile, and if half their face is drooping, call 9-1-1 immediately. A – Arm. If someone suffers from sudden weakness or paralysis on one side of the body, it could be a stroke. As the person to raiser his/her arm, and if one drifts downward, call 9-1-1 immediately. S – Speech. Sudden slurred speech or difficulty with words could be the sign of a stroke. Ask the person to talk, and if they have sudden difficulty, call 9-1-1 immediately. T – Time. 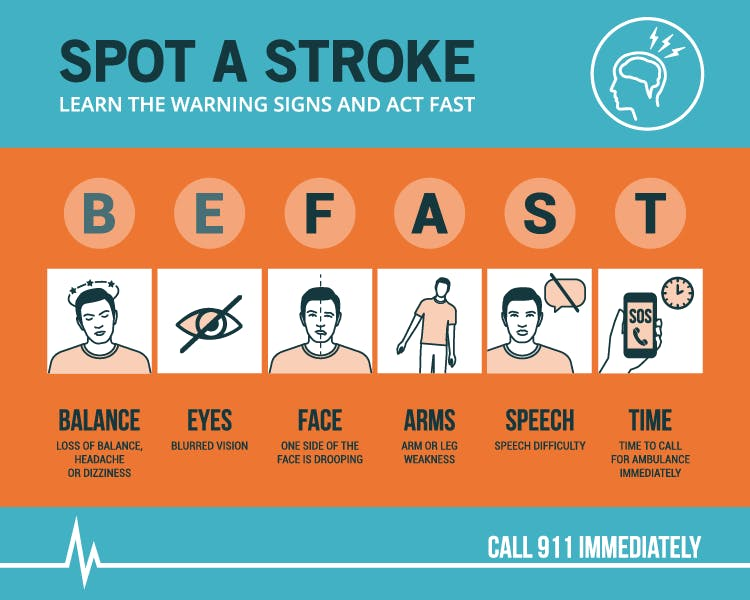 If you see any of these symptoms, call 9-1-1 immediately because time is brain when it comes to stroke! This is because brain tissue is deprived of oxygen-rich blood when a stroke occurs, and brain cells begin to die. When a stroke continues without treatment, more brain damage continues occurs. That’s why fast, immediate care is essential. However, those aren’t the only signs of a stroke. Symptoms can really vary from person to person. This is because not all brain tissue is the same. For example, the left hemisphere of the brain controls language, so a stroke in this area could result in slurred speech but no other symptoms. Different parts of the brain control different functions, so every stroke is different – especially cerebellar strokes. Cerebellar strokes are rare, accounting for less than 2% of all strokes, and they cause much different symptoms. *Vertigo is a huge one. About 3% of people rushed to the emergency room for vertigo are actually having cerebellar strokes! So even if someone appears “normal,” any sudden symptoms could be a sign of a stroke, and emergency medical attention is needed. There are many different signs of a stroke, which can make it difficult to identify. The biggest rule of thumb is that if anyone suffers from sudden onset symptoms – from facial drooping to a piercing headache – it could be a stroke. Rebecca, an active 50 year old woman, was meeting a friend for coffee when she noted something was amiss – despite the perfect grammar of her thoughts, her speech was coming out garbled. However, by the time she finished her coffee, she was speaking normally, although she did note that she was having a harder time “finding her words”. The next morning she was back to her normal self. She went to see a doctor a week later, who ordered a specialized imaging of her brain. The imaging results showed that she had two strokes over the past week. Her story was just an example, but it illustrates how seemingly innocuous a stroke can be. If you ever experience sudden symptoms, don’t ignore the signs and call for help! Generally speaking, you can identify a stroke FAST by watching for facial drooping, arm weakness/paralysis, and slurred speech. Other rare signs of a stroke include vertigo, dizziness, headache, vomiting, and vision problems; and these deserve emergency medical attention too. The best rule of thumb is that if you experience any sudden symptoms, then it could be a stroke and emergency medical attention is needed. Time is brain when it comes to stroke. Knowing the warning signs could save a life! Please share this article to help spread stroke awareness. Newer Types of Stroke and Symptoms: Know These Facts to Help Save a Life!